STATESVILLE, N.C.– Front Row Motorsports will have two familiar faces behind the wheels of its racecars in 2017. Landon Cassill will return to the team and drive the No. 34 Ford after an impressive first season with the team in 2016. David Ragan, who drove for the Statesville-based organization from 2012 to 2015 and earned its first win, will rejoin the team to drive the No. 38 Ford. The team will continue its technical alliance with Roush Fenway Racing and its engine program with Roush Yates Engines. The 27-year-old Cassill earned seven top-20 finishes in his first season with Front Row. One of the series’ steadiest and most reliable competitors, he completed 98 percent of the laps run and was the only premier series driver in 2016 to finish the season with just a single DNF (Did Not Finish). The Cedar Rapids, Iowa, native will enter his eighth year competing in NASCAR’s premier series. 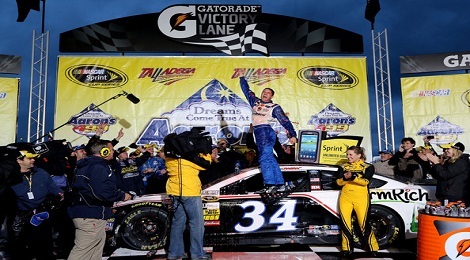 Ragan is a 10-year veteran of the series who made history for Front Row Motorsports in 2013 when he charged through the front of the field on the final lap to win at Talladega Superspeedway, sending owner Bob Jenkins and his team to Victory Lane for the first time. The 30-year-old Unadilla, Ga., native owns two premier series wins, 15 top-five and 36 top-10 finishes, and two poles. “These are two hard-working guys, both in the car and away from the car working with our partners,” Jenkins said. “We went out and got Landon last season because we knew he was talented and we wanted him in our racecar, and now we’re really happy he will be back another year. Despite a combined 17 years of experience, 2017 will be the first time Ragan and Cassill will be teammates. “It’s a nice homecoming, coming back to Front Row Motorsports,” Ragan said. “I’ve always had a great deal of respect for Bob Jenkins, how he put together his team and grew it the right way over the years. We’ve celebrated some pretty big highlights together, and now we need to go make more.